True - we were expected to have a good year this year and Miss St wasn't during 2014. But we still aren't a traditional power, and when non-traditional powers make runs, even if it is a carryover from a previous season, there tends to be a fair amount of doubt from people in the sport generally. Especially from someone with blue blood ties like Jay Williams. I think that is what drives the doubt. If Tennessee is able to consistently be a top team over the next several seasons, the doubt and skepticism about staying power go away. Kind of like what Oregon did in football. They were a solid program for many years under Bellotti, then when Kelly took them to another level, nobody really thought they were a pretender or about to fall off a cliff. It takes more than just a couple of years. We're pretty far removed from Pearl now. We were a good team last year, but remember we aren't far removed at all from Rick's first 2 rebuilding years, the Donnie Tyndall year, and the Cuonzo years which did include a flukish Sweet 16 run but were underachieving teams. Well they are Kentucky, and they are playing very well, so they are going to get talked up. Second, most broadcasts usually hype the team that is on their station. It's happened forever. Brent Mushburger used to act like every team every week he covered was the best team in the world. Third, they have UK vs. UT coming up in a few weeks....think maybe they might want to be hyping that up a bit? And fourth....several at ESPN has stated UT is a legit national champion contender and calls us a Final Four team. There's a little bit, not a huge amount, of a "perfect storm" thing going for Tennessee this year too. What Barnes has done is developed an incredible team from several overlooked, lightly-recruited guys. Not only did they improve last year, but the entire team returned, which is pretty rare in CBB. Next year, there will be no Schofield, Alexander, or Williams. Josiah James is coming in, but how does it fit with Jordan Bone still there (assuming he's not going pro yet?). Josiah James, Bone, Lamonte Turner, Bowden, and Pons are a good team, but are they an SEC-winning team? Where is the size/strength? Where is the balance? It won't be anywhere near remotely as good as this year's team. It's honestly kind of similar to what happened to Kentucky this year in football. Kentucky recruited/developed well over the last 2-3 years, and it culminated in a veteran, senior-heavy team that had a great year last year. However, it's more difficult for them to reload, so perhaps they'll need another couple years before having a "good" year again. Same with Tennessee basketball after this year. The only thing I see as comparable (in that they both reached #1) is that neither were/are "bluebloods" in those respective sports. The point I was making was specific to both teams reaching #1 and less about the sustainability of that going forward past that or this particular season. How they both got there and whether one being a surprise and while the other isn't is where I see the big difference. I don't think its a shock that UT got there this year. After last year and returning everything many thought they were Final 4 able. UT may not be the best team in college basketball but they have proven they re right there with whoever is. I don't think anyone really thought State was even when they were #1. They re days were numbered and most everyone knew it. What happens next year is anyone's best guess. Im not sold that Williams leaves early. It will be a different team with AS and KA gone. You have to remember though - Tennessee wasn't expected to be good last year. Just this year. I'm thinking about this from a non-Tennessee fan, national pundit-type perspective. Tennessee's "come out of nowhere" year was last year. This is the first year in many years where some sort of expectation has been put on the program. Tennessee being #1 isn't exactly the same as Miss St being #1 in football a few years ago, but other CBB fans look at Tennessee's #1 in kind of the same way, IMO. What Tennessee is doing is like if Miss St came out of nowhere in 2014, kind of faded down the stretch (which is exactly what happened), then was a very strong team again the next year. They'd still have doubters. We certainly are right up there with anyone else. Wouldn't argue that for a second. But when you look at the current top 10 or top 5, as a national pundit, there's a name that kind of sticks out to you as being a little unusual, and that's Tennessee. Even a school like Nevada, another "outsider," has made the tournament 2 years in a row and went to the Sweet 16 last year - Tennessee can't even say that. So when people go for hot takes, or try to separate pretenders from contenders, Tennessee is an obvious place to start even though we are a great team. The Tennessees and Nevadas of the world don't get the benefit of the doubt...the Dukes and Kentuckys do. Disagree. Most fans with any knowledge knew Tennessee was going to be very very good. The running joke I get here (Washington DC/military) is that we’re a basketball school now. 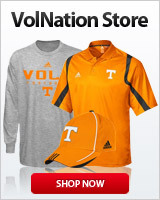 There really is some awkward inferiority complex a lot of Tennessee fans have. Schofield and Williams are getting love from lots of fans I know that cheer for schools all across the country. The bold is precisely my point. Had they got to #1 last season it would be more comparable to States situation in 14'. A complete shock. Thus the reason for the difference in comparing the 2. Historically yes, its odd to see UT in the top 10 and now at #1, the national pundits however have seen them start the season as the #6 team and steadily climb to the top spot. Its not like they just fell out of the sky like they did last year. Is it expected that they jump on Cal's jock once UK started right the ship? Sure. They are playing really well right now. Do you expect them to get a chub every time Coack K and Zion is mention? Absolutely. I personally don't care. The lack of attention today is more than fine with me. Once watching a UT football game the ESPN analysts kept talking about a horse race. I mean as the game is on, watching plays happen, they were ignoring it entirely and instead talking about a horse race for at least 5-10 mins. They beat a Kansas team at home that lost their best player. Kansas has looked average since he went out. This WILL sort itself out!! Tennessee played Kansas when they were at full strength. Vandy ran a completely different offense than they had in previous games vs Tennessee. It took Tenn by surprise in 1st half and Vandy shot great in 2nd half just like they did vs Ky. Since then OU beat the hell outta them and so did Ky. Nothing surprising. Ky is playing good. They’ll win every game from now until Tenn for sure. There’s a pretty big drop off from Tenn & Ky to rest of the league if you ask me. UK and Duke have been ranked # 1 in the polls 1000 times each...UT has been ranked #1 for 3 weeks in its history. The bluebloods will always get the attention. Explain to me what other weeks in history UT deserved to be #1 and didn't the attention they deserved. The only complaint when it comes to rankings is that preseason rankings sometimes make it a bit difficult to let other teams jump up. No one, not even most UT fans expected this UT team to be as good as they have been. Of course ESPN and people will hype up a flashy group of recruits who are NBA locks for next year vs a team with two 6'8 guys who have been developed for 3 years. I don't disagree with you. To me, being ranked #1 is great and all but there's 11 reg. season games left. IMO, Uconn fans couldn't care less that in 2010-11 their highest ranking was 4. It is possible that there’s more than 1 good team in the nation. If we tcb then it is better for us. Coach K and Cal have earned the benefit of the doubt. I love CRB but he has not.